On previous trips we have stopped over at Japan or Taiwan before arriving in Hong Kong. This trip we arrive in Hong Kong first and then after a week we plan on flying to Okinawa in Japan. As adults you can sometimes tough it out and sleep a few hours to help get over the jet lag, but young kids don't seem to be able to sleep in on demand. So four am rolls around, we are up and looking for something to do. Our first few mornings, we went to the wholesale fruit market to start our day. A few vendors do sell small orders of sometimes high end fruit. We bought strawberries at roughly 1/3rd the price of the prices at CitySuper. We bought a durian (which isn't really in season) which was quite expensive, but not available at other outlets. Of course a visit to the fruit market doesn't use up the whole day - we still have hours before the sun comes up. Helen wanted to try a 24 hour Ramen place in Tsim Sha Tsoi, but when we arrived, it was closed. Grrr. The kids acted up so we went for a walk near the harbour to try and burn off some energy. When the kids wake up at 4 am, they won't be staying up all day. A few stops down the MTR is Sham Shui Po - a neighborhood that once had garment factories and still has lots of craft appropriate stores. We went for a brief walk to the beads stores and the kids filled baskets with small beads. Nara and Claira have different strategies - Nara got a lot of large pieces with a single necklace in mind. Claira grabbed small handfuls of beads she liked. When we went to make jewellery at home, Claira's selections proved more flexible. A new one for us - we went to Po Kong Village Road Park. This park is about half an hour by bus from Mong Kok. You can rent bikes (Helmets mandatory) and ride your bike. There are two tracks - a small round track for training wheels and a km loop for two wheel bikes. They have training wheels for bikes of all size (including adult sized bikes). Claira was quite happy going around the small loop while Mom watched from a bench. Nara and I rode on the larger loop. The loop has hill on one end so you need to do some work to get up and then a long downhill segment as your loose your elevation. The park is surrounded by apartment buildings. The larger loop has faster bikes (no training wheels allowed). One gentlemen was doing loops on his personal road bike. Hong Kong roads are narrow, often steep and consistently busy. To ride a road bike on the streets of Hong Kong, you need to be really good shape. The park also includes a decent sized playground. Helen's Grandfather lives in Mong Kok. Any day we can go out for a walk, but weekends are especially good in Mong Kok because transit to far away places is usually extra busy and many markets in Mong Kok are fullest on the weekends. We usually walk up to Prince Edward to see the bird and flower market and then walk through the goldfish market to get back home. The kids were trying to find a place selling kittens or puppies (Chinchillas were an interesting distraction, but not what they wanted) when we heard a huge amount of crashing. A restaurant was opening and they had a group in to do a lion dance to open it. The basically closed traffic on the street for the dance and the crowd of people watching. The kids agreed to watch the dragon dance. Mong Kok is basically the prototype for street photography - a constant churn of tourists from all over the world mixed with locals trying to make a dollar. The kids walk around this neighborhood every day. Hoi Ha Wan is at one of the extremes of Hong Kong - North and east of the city, it's at least 45 minutes by bus from the closest MTR stop. It is listed as a Marine Park with good snorkeling. We took the little green bus out to Sai Kung (the queue is almost in front of our door) and from Sai Kung, we took the "once every half hour" tourist bus out to Hoi Ha Wan. There seemed to be more domestic helpers on the bus than any other group. The village has nice signs directing you to the beach and the the trails. We chose to walk out to the pier first to look around. The trail was well kept and easy for kids. When we got out to the pier it was pretty obvious it wasn't going to be a warm day. The kids wanted to go to the beach anyways. The beach is pretty course sand (like most beaches in Hong Kong), but we basically had it to ourselves. The girls collected shells and played in the shallows. The water was warm but the tide was in so there wasn't much to see. Sadly the bus ride is a bit twisty so we decided not to stay for lunch in the village before heading back. We packed up in a hurry (bus only comes once every half an hour) and rode the buses back to Mong Kok. If we can plan the tides and weather better, I'd like to go back! I've been to the Deep Bay Hides at Mai Po Marshes at twice before this so I thought I had some idea what to expect. The tides are always a bit of a wild card, but you can adjust for that a bit by changing hides. I got to the first hide, opened the shutter and saw a woman on a mud sled, but almost no birds. Uh oh. I'm told she is doing illegal fishing for mud skippers and the birds weren't at all pleased - they were no where nearby. I went to the third blind and hoped she wasn't going in that direction. The tide today started high and went out as the day went on, making the ocean's edge further and further from the blinds. A beach has many different zones for birds to specialize against so as time went on some birds left and new birds arrived. It is easy to get a crowd shot of many different birds in the same scene, but isolating a single subject, close enough to get details required a bit more patience. I have a soft spot for small birds so I really liked watching the Plover's run around the exposed mud and plants. These small birds eat small things and apparently quite a bit of them because they were always moving for their next meal. Next up are the small specialized birds. These birds have really long legs or bills or both to give them an advantage for eating things in the mudflats. Long bills lets them get into the mud for worms. Up turned bills are helpful for skimming the surface for small insects. Birds get larger. These birds are generally slow moving ambush predators going after fish and worms. I have a soft spot for Kingfishers because there are so many choices in Asia and only one fairly plane Kingfisher in the Pacific Northwest. Apparently there are four species you can see at Mai Po, but so far I have only seen 3. Seagulls seem to have a pretty common strategy world wide - why hunt when you can steal from other birds. Of course that behaviour was on dispay when another bird had some nice. And then you get the marine predators. Osprey are world wide and eat mostly fish. There are a variety of forest adapted birds that also make appearances when the water is out. These are generalist birds without adaptations for mud or filtering, but can still find a good meal on temporary ground left behind by the tide. On previous trips to Mai Po I have seen butterflies flying around the mangroves. Apparently there behaviour is quite temperature dependent - if it's not warm enough, they don't fly so much. I did see insects flying, but it was much easier to follow them to where they landed and they perched for long enough that I had a chance to take a photo. Considering previous trips I got no good photos of butterflies, I was surprised how productive this trip was. I've been to Hong Kong 11 times now and I am still finding new things to do and see. Before kids we generally came to Hong Kong in the fall or winter. Now that we have kids in school, we are constrained to try and make the most of Spring Break - two weeks off in March. I've been to Mai Po Marshes a few times (and will hopefully return), but I was hoping to diversify into some new sites. I found a Hong Kong Nature Walks and booked a day to explore some places I haven't been before. Our first stop was the Tai Po Kau Nature Reserve close to University station in the New Territories. This large park has a tiny parking lot. We somehow managed to find a spot to park and started up the hill into the park. David pointed our birds in the trees. We passed the offices of the rangers and headed to small clearing with water running on one side. In the shrubs, grasses and brush, we found butterflies. We headed up the hill to a second clearing with a prominent stand of coral trees. From time to time, birds would fly into the trees to either drink from the flower or eat what was feeding on the flower (I'm not sure which). This second clearing had more species of butterflies in a small fenced off garden. There was a large hedge area that looked like it was butterfly forage. The clearing also had a pond. It was early in the season for dragonflies, but we did find a Russet Percher in the nearby grass. David spotted a red eared slider (the same aquarium turtles we see in Canadian ponds), and David found a pair of toads "busy". After a pleasant morning, we walked back to the car and stopped at a nearby park for lunch. In the afternoon we went to the Fung Yuen Butterfly Reserve, a short car ride away. The area looks like it was once a farm but has been converted into a woodland park with trails and gardens. The gardens are stocked with plants that butterflies like - either food for butterflies or food for caterpillars. The signage around the reserve was excellent and the entrace/gift shop sold a guide book of all of the species of butterflies you might see here. We started by walking a path through dry underbrush - a recent forest. As you walked through, you would distrurb unseen butterflies but then watch them quickly settle back on their host or a nearby plant. I was particularly taken by Lemon Pansey because it had vibrant "top" - dorsal side, but a muted "bottom" - ventral side. I had assumed that butterflies were mostly the same on both sides. Some larger or quite vibrant butterflies are really attention grabbing. You wonder how an insect that is so brightly coloured doesn't get eaten - I assume they are either poisonous, or have another strategy to avoid predation. Three "Tigers" - different species from the same Tribe. It's still quite early in the season for dragonflies, but there were some of them as well. One of our favorites was a pair (or maybe three) skinks playing in the underbrush. They were probably in mating season because they exposed themselves quite frequently while chasing each other around. Helen's Aunt Jennie has family connections Shek O. Shek O is beautiful, but it's a long, twisty bus ride after a long MTR ride. I was looking for something closer and I picked Repulse Bay as being close to an MTR station and a nice beach. 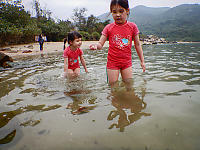 Helen's aunt said the water is dirty (compared to Shek O). Helen wasn't feeling well, so I decided to go with the kids for a swim. Repulse bay is full of very expensive apartments, many of which are fill with ex-patriots. I didn't realize how much Repulse Bay is actually disconnected from what the rest of Hong Kong is really like. When we arrived at the beach, we were hardly alone - a continuous stream of tour buses unloaded mainland Chinese tourists looking to take photos of anything foreign, including me and my kids. Of course none of them were here for the swimming (which was quite nice) but they did take lots of selfies with on foot in the ocean. The kids and I got changed and went for a swim. The water was nice and the life guards were certainly aware we were in the water. After about an hour swimming around, we went in for lunch. In Shek O, the restaurants have basically Chinese dishes (even though they might be Thai, or BBQ themed). Repulse bay restaurants seemed like a mash up between pubs, beach restaunants and American fast food. We went for lunch at a place with a kids menu (not common in Chinese restaurants) that had grilled cheese and fries. The kids loved it. There is a new mall in Repulse bay, but you might have thought it was departure lounge for long haul flights. Most of the customers were foreigners or Nannies with foreigner kids. They had two free bouncy castles and a Tesla dealer. The kids stores were doing okay and the store selling kids socks from Australia was making a killing selling socks to kids that wanted to go onto the bouncy castle. Our kids probably spent an hour jumping. It all fell apart when I wanted to get back to the MTR station. The bus was no where to be found and the taxi's had entirely evaporated. After waiting too long, we got on a bus that went over the mountain back to Central and Nara got bus sick. If only I was more comfortable with Uber. Still, a pretty good day! The kids have grown to the age that we can't really deny that Disneyland exists. The Hong Kong Disneyland is one of the smallest so I figured it would be a safer introduction to the world of theme parks. We did some research online, but even then we weren't quite prepared to make the most of the day. Claira is 4 so a lot of the faster rides aren't yet age appropriate. The first ride we saw that they were excited about was the carousel in the view of the castle. The lineup was short so we went for a ride! After that, we tried the Winnie the Pooh ride. Then the Jungle River Cruise. We saw the lion king show. We saw the "it's a small world" boat show. Several times a day the park hosts a "parade" down main street. People in this part of the world aren't well known for lining up and staying behind barriers, but there were plenty of Disney "Hosts" to ensure everyone was seated off the parade route and didn't try to cross the parade while it was running. We had dinner on site (not cheap, but very western kids friendly) and as the sun was setting we got one last ride on a carousel. We didn't stay long enough for the fireworks (the kids were just too tired out). Not a cheap day, but the kids did have fun. I think this is an activity we can grow into - next time they might be able to do more of the rides and last long enough to see the evening fireworks. On my first trip to Hong Kong, I stumbled onto a showing of winners from a "In Hong Kong" photo contest. The winning entry was a photo of the columnar basalt near High Island at Sunset. I've always had a thing for Columar Basalt, but I haven't yet been that close to the rocks. This trip I changed that. In Sai Kung, there is a geopark museum that offers free tours out to the resevoir where you can see columnar basalt. In classic Hong Kong fashion, I got to the museum to find out the tours for the next two days were sold out. They suggested I take a cab. About 150HKD later (about 25 CAD), you are standing on the High Island reservoir looking over what was once the inside of a volcano. Back in the 60's when Hong Kong and China weren't on a good footing, Hong Kong was worried about it's water supply. Some engineer figured out they could dam a valley out in the New Territories and make a freshwater lake where there was once just a valley. Lots of effort later (there are two dams - one to keep the lake in and another to keep the ocean away), the lake started filling up and Hong Kong had a long term water supply and a new tourist attraction - go see the dam! The road is paved, but one way only so it seems a bit crazy when the taxi drivers are driving at 50 km/h around blind corners honking away to hopefully prevent an accident. Nara and I did see the columnar basalt, some feral cows and "Sensitive Plant" - an invasive weed from North America that folds it's leaves when you touch it. The taxi ride back is even more challenging (if at all possible, try to avoid getting a taxi around 4pm), but we were back in Mong Kok for dinner. Big picture, the reason we go to Hong Kong is to visit family. I don't bring the camera out every time we have family together, but it is nice to have photos of people. Helen's friend Katie flew in from Taiwan for the day to join us for a meal an a bit of shopping. Nara and Claira remembered Katie from last year when we visited. Jennie helped us out when the kids were born and is a great help every time we come to Hong Kong. She watches the kids when Helen and I go out in the evenings and she takes Helen out clothes shopping when I can't take it any more. Her son Alan is engaged to Kat and we sure hope we can make it out when there is a wedding date announced. While we are in Hong Kong, we stay at Helen's grandfather's house. The house is small by western standards (on bathroom for three bedrooms) but quite workable for the two weeks we are there. There is a pet turtle that needs taking car of - Claira sometimes helps moving her back after her tub is cleaned out. Helen's grandfather is still doing well. His walking is more limited so we arranged for him to get a wheelchair and a walked for getting around the house. The kids can speak some Cantonese so they can understand him a little.